Daily Messes: Saturday 9/19 Is International Talk Like A Pirate Day! Saturday 9/19 Is International Talk Like A Pirate Day! 9/19 is International Talk Like A Pirate Day! There are so many ways to celebrate. We have a blast with this oddball holiday every year. Are you ready to don your pirate hat and seek treasure and adventure? If not, here are some ways to celebrate! 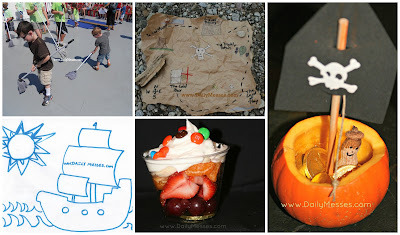 Make Buried Treasure Cups (click link for directions). Our first treasure hunt ended up at the fridge for the buried treasure cups. If you live near a river, etc. with river boat cruises, see if they have a pirate themed cruise. We did one a few years ago, and the boys loved it!